Learning goals are important for our students’ education and learning. When we have a goal in mind when teaching, everything else serves a specific purpose, and everything seems to fall into place. As teachers, we are asked to display these learning goals in our classroom, but for me, this wasn’t possible. With 30 plus students in my class, I didn’t have time to write my learning goals on chart paper or display them on the board. Hmmm… what’s a girl to do? I created these posters to make my life, as well as yours, easier. This bundle offers ALL of the senior, (grade 12) goals and is in line with the Common Core as well as the Canadian curriculums. – A 14-page checklist of all of the learning goals, which can help the teacher keep track of what’s been covered and what hasn’t. 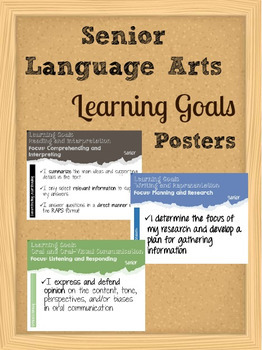 – 55 Learning Goal posters (8×11) that can easily be posted on the bulletin board or the chalkboard at the front of the class. These posters allow students to track learn the focus of the lesson. 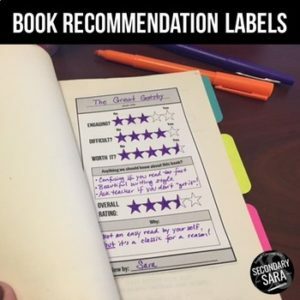 Give your classroom library a word-of-mouth makeover, and give students ownership of recommending (and choosing) their own books! The form is quick and easy for students to fill out, and it tells students what they REALLY want to know about a book before they begin reading, including difficulty level, whether or not it’s engaging, and if the book is “worth it”.